Millions of Americans live from one day to the next uncertain where their next meal will come from. 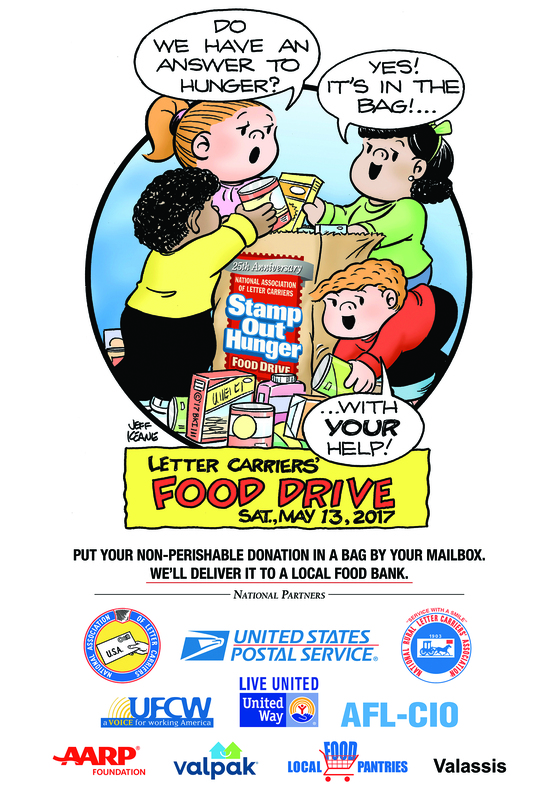 This sad statistic reinforces the importance of the National Association of Letter Carriers’ annual national Stamp Out Hunger® Food Drive, held the second Saturday of each May. This year’s event will be held Saturday, May 13, 2017. Sponsored by the National Association of Letter Carriers, the drive has collected over 1.5 billion pounds of food sin 10,000 cities since its inception 25 years ago. Leave your non-perishable donation in a bag by your mailbox, and your letter carrier will deliver it to a local food bank. To find out how to volunteer at your local post office to sort food, visit nalc.org. This entry was posted in All News, Events and tagged food drive, National Association of Letter Carriers, Stamp Out Hunger on March 14, 2017 by admin.